Getting a little bored with your safe starch rotation? Hunting for a way to switch things up without heading into non-Paleo territory? Consider trying plantains! On the outside, they look pretty intimidating – bigger, harder, and less welcoming versions of bananas. But under the skin, you’ll find a mildly sweet, starchy flesh that fries up perfectly in your favorite cooking fat, bakes into delicious crispy chips, or adds a little oomph to all kinds of fish curries and other tropical-themed recipes. 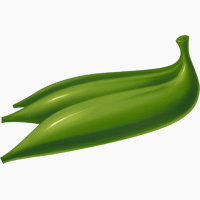 Green plantains: starchy, with just a hint of sweetness. They taste a little like potatoes, and work well in savory curries and stews. If you’re going make plantain chips, you’ll want them green. Yellow plantains: a little sweeter and less starchy than the green ones; they’re a middle ground between green and black. They’re still not as sweet as bananas, though. Black plantains: sweet (almost like a banana) and soft; bake them and eat them for dessert. Most grocery stores have a mix of colors, but you can also get green ones and wait for them to ripen into the stage you want. To give you a better idea of exactly what you’ll find inside these tropical fruits, take a look at how they stack up against two contenders: bananas (their closest botanical relatives), and sweet potatoes (a familiar “safe starch”). *Don’t get too excited over Vitamin A in plant foods, though: it has to be converted to a usable form in your body and the conversion isn’t particularly efficient. If a vitamin or mineral is not listed, it’s because none of the three foods has any significant amount of it. From this chart, you can see that plantains are like bananas with the nutrient content ramped up to 11. They have more starch, more vitamins and minerals, more everything. They also compare favorably to sweet potatoes – equally good for you, but containing slightly different nutrients. Another nutritional question you might have about plantains is the breakdown of their carb content: how much is starch and how much is sugar? The answer: it depends on how ripe they are. Green plantains have more starch and less sugar, and as they ripen through yellow into black, they slowly become sweeter and more sugary. So if you’re very concerned about avoiding fructose specifically, go for the green varieties, but most people shouldn’t have a problem even with the black ones. They might look like bananas and smell like bananas, but you certainly don’t want to eat a plantain raw. They’re much too hard and woody if you try to just peel them and take a bite: to get the full nutritional advantage of a plantain, you have to cook it first. Plantains can be baked in the oven, grilled on the barbecue, pan-fried on the stove, or incorporated into other dishes. In general, the black are best for baking them whole: this gives you a savory-sweet dessert that’s a little like the bananas in these chocolate banana boats. For a recipe like that, you could just as easily use plantains instead. For grilling, try the yellow variety: they’re not as sweet as the black, but still not quite starchy. Grilling them is very easy: slice the plantain in half lengthwise (to make two thin slices), and grill on each side for about 15 minutes until they’re done. Then serve them under a bed of fish tacos or jerk chicken and enjoy. For frying them, you can choose either very ripe (yellow) or unripe (green) plantains: try it both ways and see which one you like. It’s incredibly easy: just take 4-5 tablespoons of your favorite cooking fat, slice the plantains into disks about 1 inch thick, and fry the slices on each side for about 4 minutes (or until they turn nicely golden-brown). Season with sea salt or cinnamon if you like, and dig in! Another option is plantain chips. For these, you’ll want green plantains: just slice them, toss them with enough oil to coat all the chips, and bake about half an hour, flipping them halfway through. As with fried plantains, you can season them with salt and cinnamon (or any other combination of spices you like)…or just wait until they’re done, and use them to scoop up guacamole! Plantains can also be incorporated into Caribbean or southeast Asian curries, soups, and hash dishes of all varieties; you can use them in a curry almost the same way you’d use potatoes or any other starchy vegetable. They’re particularly good in anything spicy, since the mildness of the plantains helps to balance out the rest of the dish. So…ready to start plantaining up a storm? Once you know where to look, you can find plantains in almost any grocery store (they’re usually next to the bananas, or sometimes off with the coconuts and other tropical fruit). Take a couple home, experiment with cooking them at different stages of ripeness, and enjoy a new and exciting addition to your rotation of starchy ingredients and snacks!